Captain Action was first introduced by Ideal Toys as a large-sized action figure in 1966 to compete with Hasbro’s G.I. Joe, although both figures were designed by the same guy, Stan Weston. Back then the figure came with alternative costumes, including Spider-man, Green Hornet, The Phantom, The Lone Ranger, and Captain America. 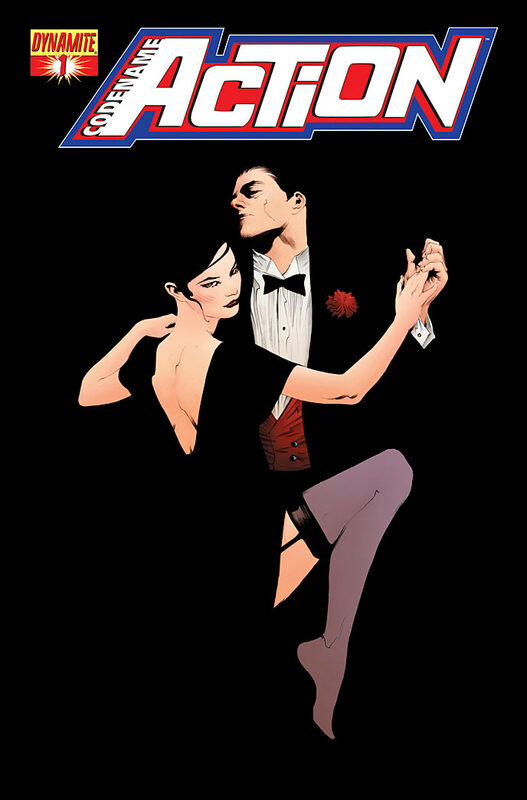 A five issue comic book series was published a few years later with little to do with the figure and his ability to switch personas. More than 30 years later Playing Mantis brought a line of toys to the market featuring the Captain Action characters. And next week, Dynamite Comics, the publisher known for its retro series like Green Hornet, Bionic Man, Ms. Fury, The Lone Ranger, and Flash Gordon, picks up the Captain Action licensing and is introducing a mini-series to reboot the character, beginning with Codename: Action, Issue #1. 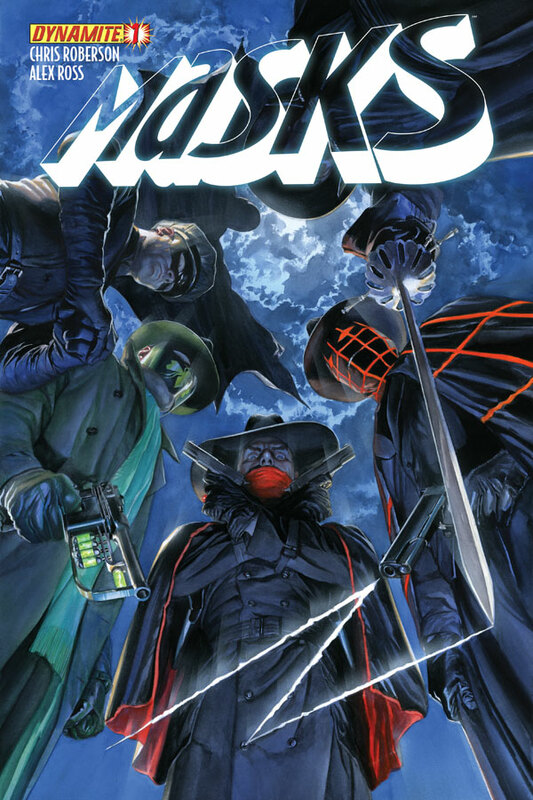 Written by Chris Roberson (Masks, Superman), with art by Jonathan Lau (Green Hornet, Bionic Man) and alternate covers by artists Jae Lee (Before Watchmen), Francesco Francavilla (Black Beetle), Johnny Desjardins (Phantom, Green Hornet), Jason Ullmeyer (Red Sonja, Vampirella), Art Baltazar (Tiny Titans), and Lau, Captain Action is the new superspy on the block complete with gadgets, a Judy Dench-type head of spy HQ, and plenty of action. Lau and colorist Ivan Nunes really bring home the retro spy look of the 1960s, complete with a team of agents driving a 1963 Corvette as their car of choice. Ever since the success of Frank Miller’s Batman: Year One , everyone has climbed aboard to use the Year One tag to sell copies. 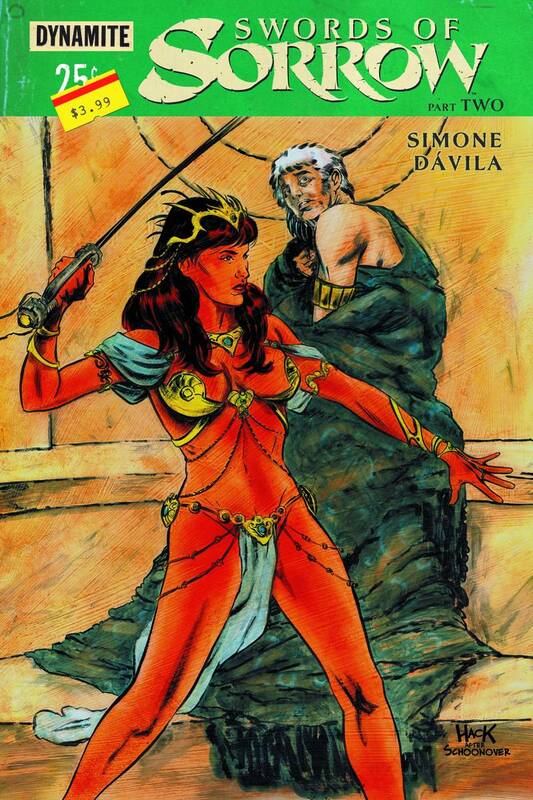 Many times the Year One is not an origin story but a random early story that fails to satisfy readers’ expectations. 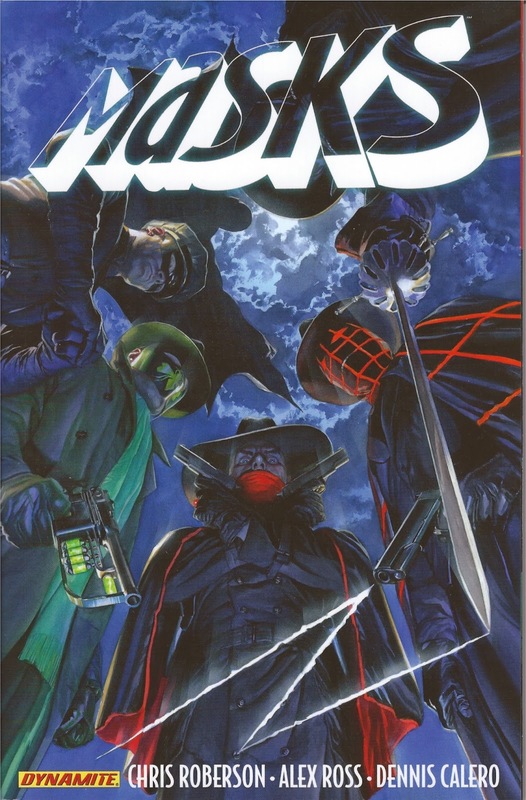 A successful twist on the Year One was Andy Diggle and Jock’s Green Arrow: Year One , but there’s also been Teen Titans: Year One , Batgirl: Year One and Huntress: Year One , Nightwing: Year One and Robin: Year One , and even Batman: Two-Face/Scarecrow Year One . 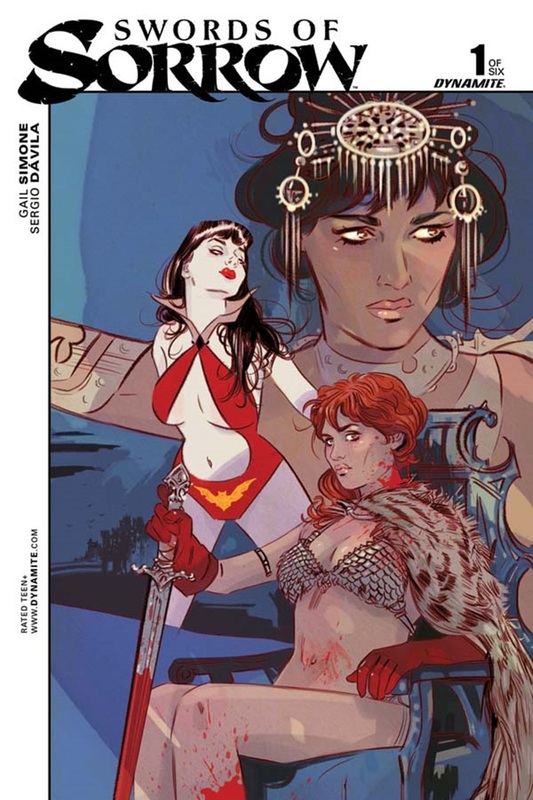 It’s not only DC Comics who has cornered the market on Year One titles. 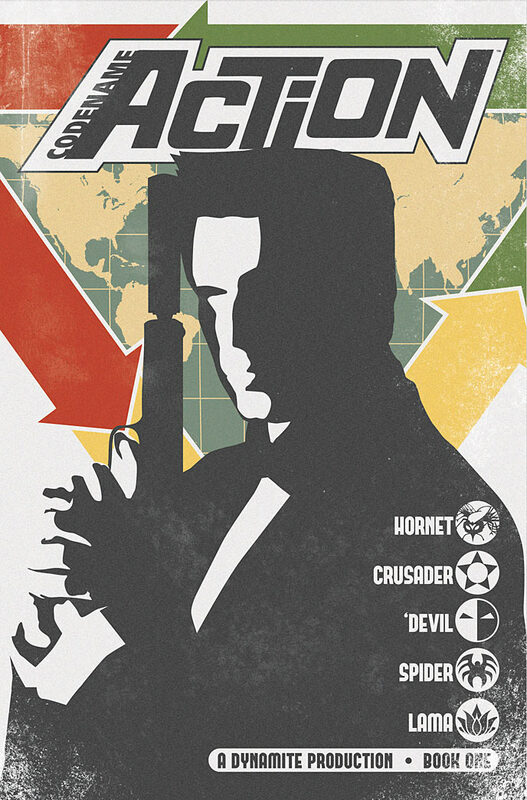 We reviewed Howard Chaykin’s well done Die Hard: Year One here last year, and if you look around you’ll even find a Judge Dredd Year One and a Punisher: Year One . 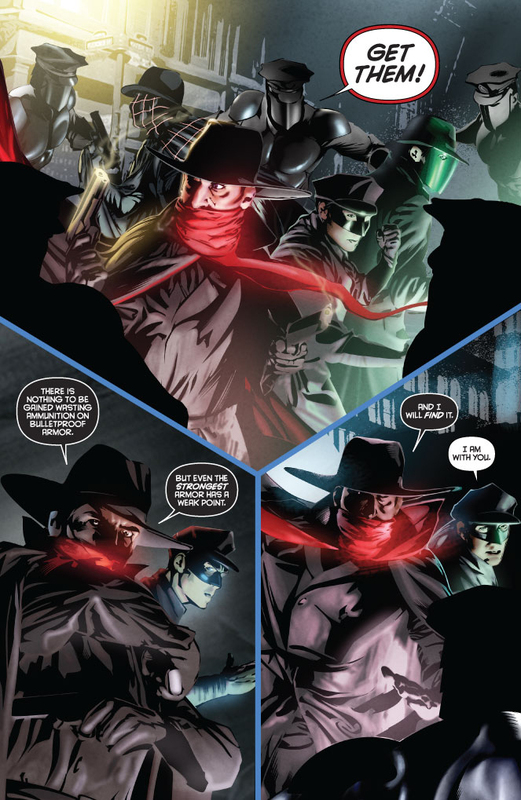 This week Matt Wagner, writer of Dynamite Comics’s Green Hornet: Year One , takes on the 1920s-1930s masked crimefighter The Shadow in The Shadow: Year One. 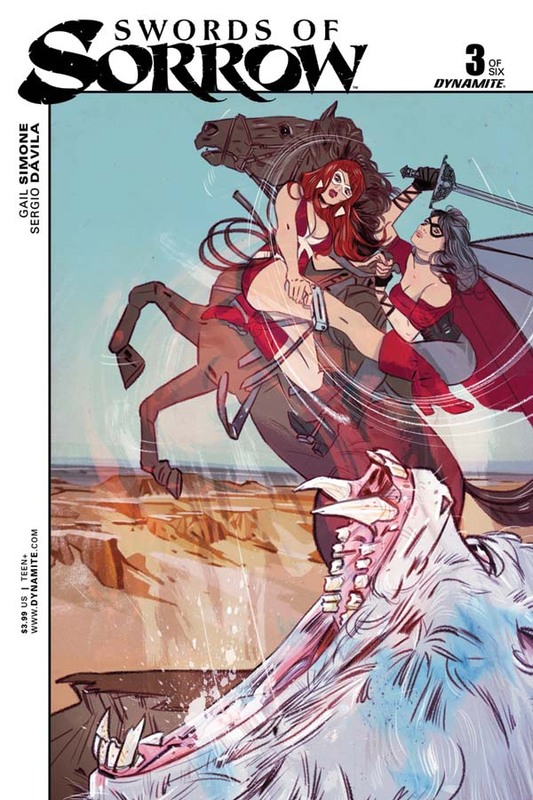 The first issue of Wagner’s Year One creation kicks off the better side of Year One stories. 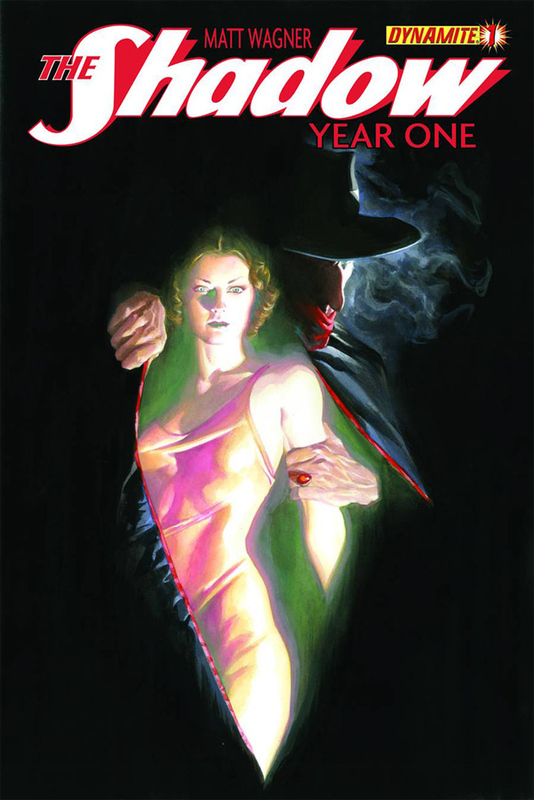 Wagner and artist Wilfredo Torres begin their Year One with a mysterious force referred to as the “Shadow of Doom” in 1929 Cambodia, where we first meet The Shadow’s alter ego Lamont Cranston. He is in pursuit of a criminal called the White Tiger and this pursuit returns him to New York City, a city brewing with criminals for The Shadow to bring to justice. If you felt like you were left wanting after reading Before Watchmen last year, or if you wondered why Dynamite Comics and Image Comics were the only comic book publishers offering up good noir stories, then Eisner Award winning artist and writer Francesco Francavilla has your answer. 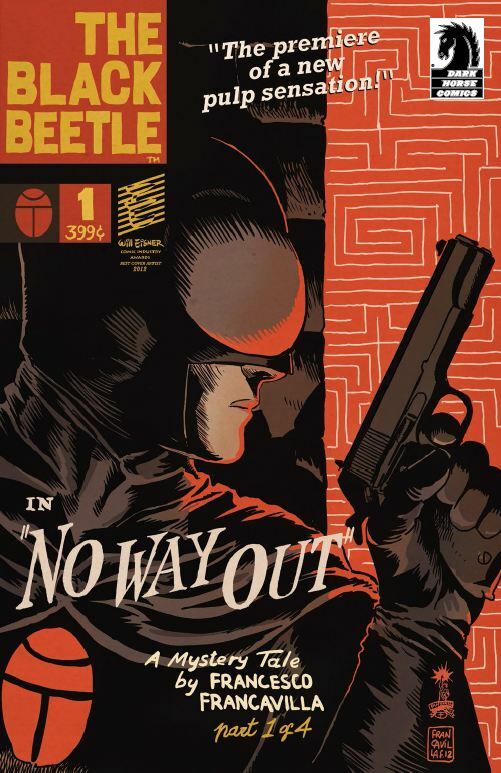 Dark Horse Comics is releasing his new four-issue pulp noir series The Black Beetle: No Way Out beginning January 16, 2013. You’ll swear you’ve seen the Black Beetle before, maybe in old 1950s or 1960s pulps. Not so. 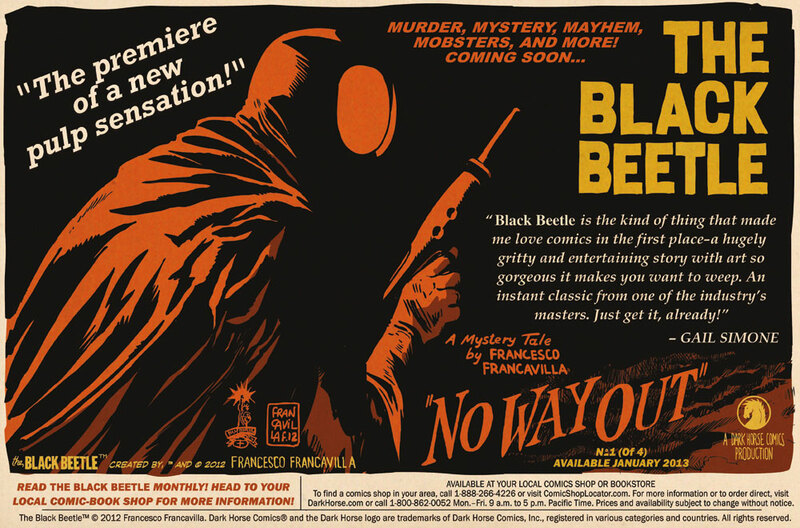 Black Beetle is entirely a new noir original creation of Francavilla. 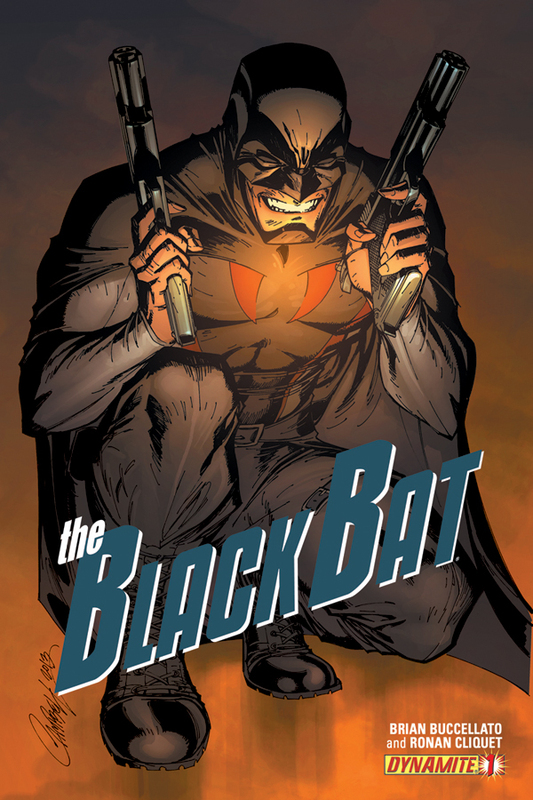 But he looks like he belongs in Dynamite Comics’s Masks series along with the Green Hornet and the Shadow.